Pun intended, and this is important. If you've been watching, the overall impression you get is of a ship listing over because it's turning as fast as it can. There's a frenzy of activity observable above deck, you can see the proverbial fire drill, and hopefully it will hold together for a few more months. China's ship of state is clearly preparing for a heavy impact and is out of fiscal policy maneuver room. Their huge dam of saved foreign exchange dollars is flooding even more quickly into world equities and commodities. I expect its government to announce a currency liberalization soon, now that it's inflating anyway. China's money supply increased 53% over last 2 years. "The latest numbers show inflation is soaring out of control in China. The CPI is up 4.9% year-over-year, up from 4.6% in December. The PPI clocked in at 6.6% compared with 5.9% last month." Producer price inflation index crests 6% in China. China's inflation statistics clouded by data reporting changes. China a net seller of US Treasury holdings for second straight month. Must be a coincidence, Mr. Treasury Secretary. The world's largest gold producer, China, imports as much gold in January 2011 as the first six months of 2010. China crude oil imports up 27% in January. The appetite for gold and diesel, physical delivery thereof, has hit the insatiable button. The entrepreneurial elites have either direct or familial memories of the Cultural Revolution, and fear something like it may happen again. Cotton prices up by 44% so far in January and February of 2011; Chinese textile makers cornering supply, amid 95% cotton price increase since September 2010. China hoarding grain in response to drought and global supply squeeze, imports running 9x higher than 2010. Yes, that wheat import number is really 9 times higher. The current drought may have wiped out a third or so of their winter wheat crop, as well as Russia's. Cotton prices have so far averaged up by 1% per day this year. They're hoarding corn, wheat and rice supplies. Adverse weather across the globe has already hit grain production, and futures contracts are now on steroids. They like not starving, and they vote (with dollars). Chinese passenger car sales plunge 10.3% in January. Automakers who dreamed of selling tens of millions of cars there probably never traveled much in the lesser cities where they play Whack-a-Scooter. General Motors did sell more cars there in 2010 than in the US, but the government has rolled back its previous tax incentives on passenger vehicles. China-based hackers knock Canadian government agencies offline. This Digital Journal article does not sensationalize the attack, and explains why it may not be government a.k.a. signals intelligence hackers as the Canadian Broadcasting Corporation accused. However, I've been seeing a definite increase in the number and target values of similar attacks, which have recently included successful server hacks on the Pentagon, utilities, and oil exploration companies. Militarily, even simple Denial of Service is an ideal asymmetric weapons, being cheap and effective if well-timed. China's power output growth slowed dramatically in the latter half of 2010. The chart from this article is above the title, comparing claimed yearly quarter-on-quarter GDP growth against power demand. 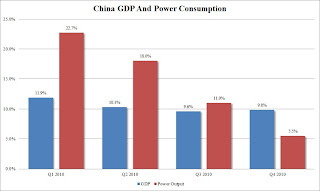 In the 4th quarter of 2010, power consumption was only 5.5% higher compared with 2009, a time of relative contraction, while claimed GDP growth remained at a 9.8% growth rate. In other words, the low Q4 demand for power and the overall downward trend makes the growth claim implausible. The power side of this chart looks very much like a double-dip recession. The relaxed power consumption figures would seem to indicate a global structural recession, if not depression or systemic failure. If these power figures are valid it means foreign marketing and design companies cut back on orders to their lowest-cost manufacturer of widgets on the planet.